Emergency Department Compliance Manual provides everything you need to stay in compliance with complex emergency department regulations, including such topics as legal compliance questions and answers—find the legal answers you need in seconds; Joint Commission survey questions and answers—get inside guidance from colleagues who have been there; hospital accreditation standard analysis—learn about the latest Joint Commission standards as they apply to the emergency department; and reference materials for emergency department compliance. 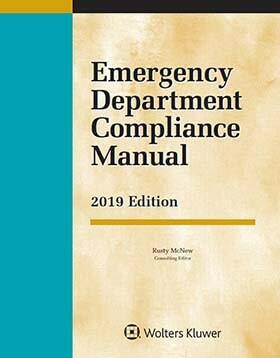 The Manual offers practical tools that will help you and your department comply with emergency department–related laws, regulations, and accreditation standards. Because of the Joint Commission's hospital-wide, function-based approach to evaluating compliance, it's difficult to know specifically what's expected of you in the ED. Emergency Department Compliance Manual includes a concise grid outlining the most recent Joint Commission standards, which will help you understand your compliance responsibilities. Plus, Emergency Department Compliance Manual includes sample documentation and forms that hospitals across the country have used to show compliance with legal requirements and Joint Commission standards.